Canon 70-200mm f/4L IS lens (handheld at 97mm) with the EOS-40D. ISO 640. Evaluative metering +1 2/3 stops: 1/200 sec. at f/6.3. 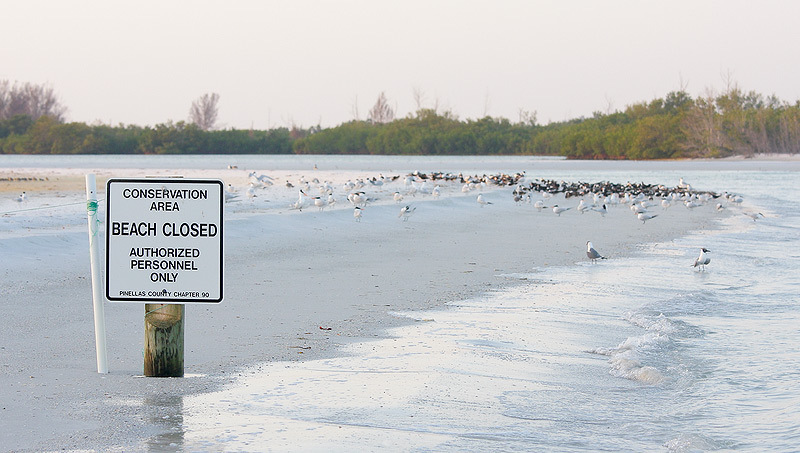 The very best area for bird photography at Fort DeSoto Park appears to be permanently off limits to bird photographers. DeSoto is, however, still a great place for bird photography, one that I will continue to visit often. 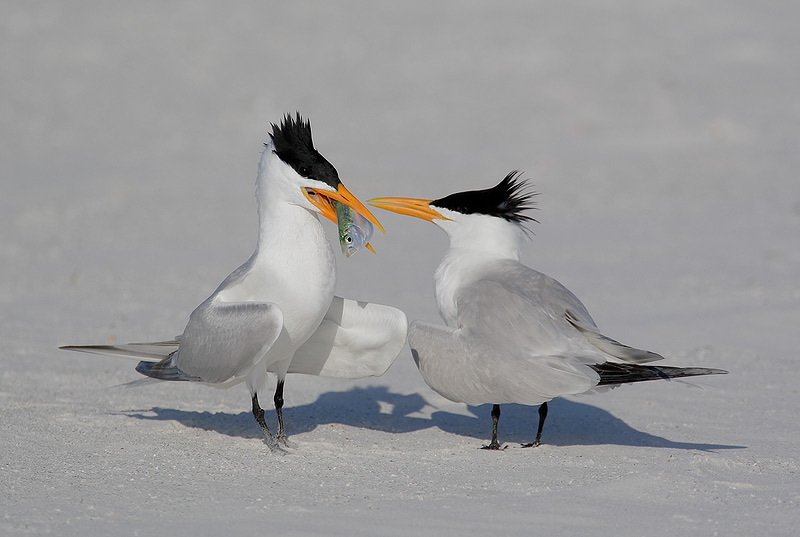 The Point at North Beach Lagoon at Fort DeSoto was roped off last spring in hopes that the Least Terns would breed. They did not, but the ropes were never taken down. Then this spring, some new signs were erected. (Getting to sound familiar???) It appears that The Point, the very best location in the park, will be closed permanently. Least Terns were on nest scrapes and Black Skimmers were acting nesty inside the ropes when I last visited so the protection might enable the birds to breed successfully this year. That is a good thing and I hope that they nest successfully. The closing of The Point for the rest of the year, however, sets a bad precedent for bird photographers. Access at Fort DeSoto had been generous for as long as I have been visiting and the birds had been doing just fine. 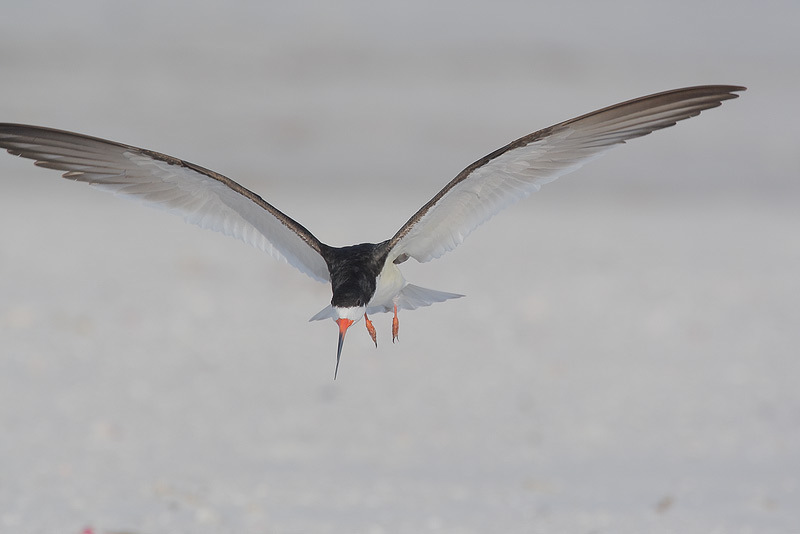 The Royal and Sandwich Terns and the Black Skimmers breed successfully each year at nearby Egmont Key which is locked up tight to visiting bird photographers. 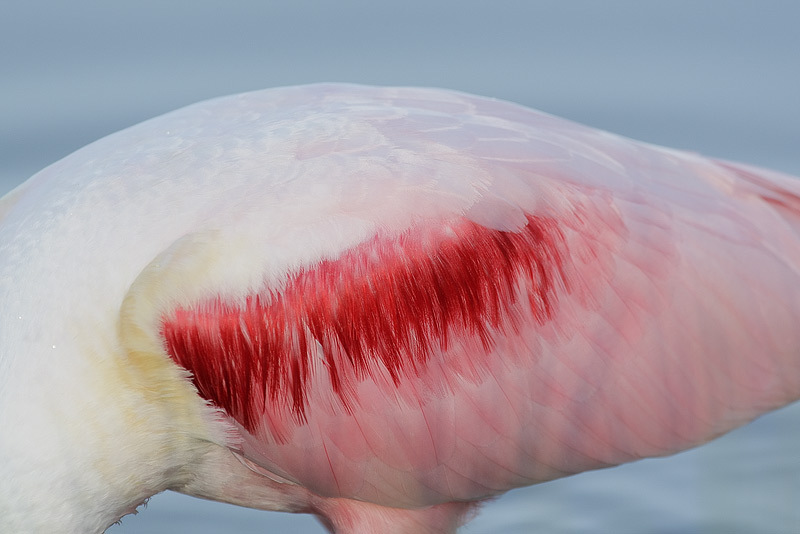 While we continue to trash the planet, destroy habitat, pollute the air and water, and while researchers disturb entire colonies of breeding birds in the name of science (so that they can get their names on research papers), access to more and more of the best sites in the US continues to be lost in the name of protecting the birds from harassment by photographers. All the while the general public, fishermen, dog walkers, etc. are free to do what they want when they want. You gotta love it. I have often spoken of DeSoto as one of my three soul places along with the East Pond at Jamaica Bay Wildlife Refuge (Queens, NY) and Bosque Del Apache NWR (San Antonio, NM). I felt therefore, that it was important to update the Fort DeSoto Site Guide so that visiting photographers would know exactly where the best opportunities would most likely await them. The latest update (free to previous purchasers) includes two highly detailed maps of the lagoons at North Beach and detailed instructions on finding the desirable species. Not only does the guide tell you where to go but it tells you when to go, the best tidal stages for most of the spots, and my morning and afternoon shooting strategies. The guide also includes more than twenty new images created this April and May. Jennifer will be sending the updates to the list by the end of this week. In the event that you do not receive your update, please do not e-mail us until Monday, May 19th. When you do so, please let us know your correct current e-mail address and the manner by which you paid originally. E-mails requesting that the update be sent this week will be deleted. In most cases folks who do not receive the update when it is mailed to the list have simply failed to notify us of a changed e-mail address. Thanks! New purchasers can order their DeSoto Site Guide now by sending us a Paypal for $50 or calling us at 863-692-0906 with a credit card in hand. If you send a check, please include your e-mail address as the guide is a PDF sent via e-mail. If you do not receive your Site Guide in a timely fashion after ordering, please check your Spam Folder and your security settings before getting in touch. After that, please contact us immediately and we will be more than glad to help. Canon 500mm f/4L IS lens with the 1.4X II TC and the EOS-1D MIII. ISO 800. Evaluative metering +1/3 stop: 1/125 sec. at f/6.3. Fill flash at -2 stops. 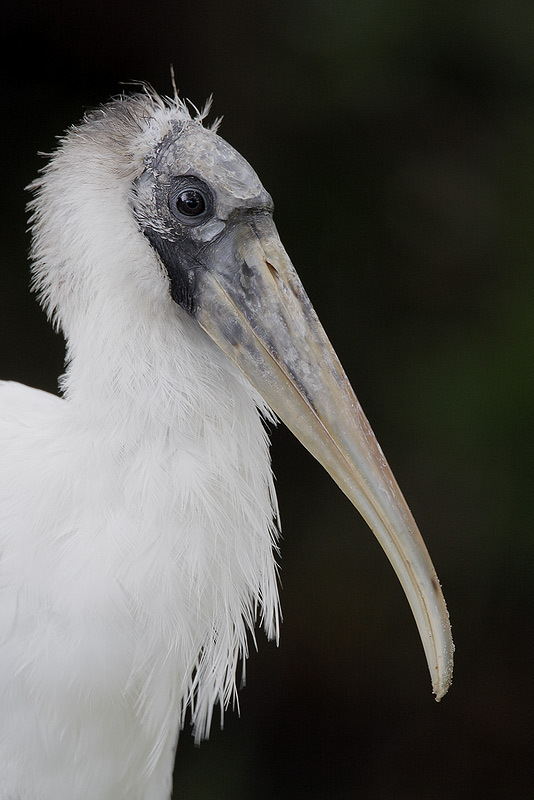 Where might you find Wood Storks at DeSoto? And how did I come up with that black background? The updated DeSoto Site Guide has all the answers. The above steps are simply the very basic steps needed to create a Quick Mask. Robert O’Toole’s APTATS CD will teach you how to use these basic steps to do amazing things to your images, to cut down the time needed to do various repairs, and to make dozens of different types of seamless adjustments. On your CS-3 tool bar, the second icon from the bottom is a rectangle with a circle inside it. This is the Quick Mask Icon. When you double-click on this icon, the Quick Mask Options box will pop up. The frame in the upper left corner says, “Color Indicates;” The default is Masked Areas. Click the button on for Selected Areas and then click OK. Now, when you are creating a Quick Mask you will not need to hit Select Inverse. This is a nice time saver. I am sorry that I forgot the name of the gentleman who mentioned this, but thanks bud! Very Important Note: If you already own and use the techniques in Robert O’Toole’s APTATS PDF and you make the change above, you will need to omit the Select Inverse step each time that you encounter it. If you make the change to Selected Areas and then continue to hit Select Inverse, you will wind up trying to work on the masked (excluded) area rather than on the selected area. Anyone who calls us or contacts Robert and wants to know why APTATS “no longer works” after making the changes above will be fined $50 US dollars. No refunds. Canon 500mm f/4L IS lens with the 1.4X II TC and the EOS-1D MIII. ISO 500. Evaluative metering +1 1/3 stops set manually: 1/1250 sec. at f/8. Fill flash at -2 stops. After adding canvas quickly and easily as described in Digital Basics, I repaired the wing tip. Then, I used a QM to select the BKGR and softened it with a Gaussian blur. We will have a good supply of our great mail order products on hand for sale. If you will be attending and would like to purchase a big-ticket item or just make sure that we will have what you want, please e-mail us mid-month. Hope to see lots of you there. Canon 500mm f/4L IS lens with the 1.4X II TC and the EOS 1D MIII. ISO 500. Evaluative metering + 1 stop: 1/2500 sec. at f/7.1. 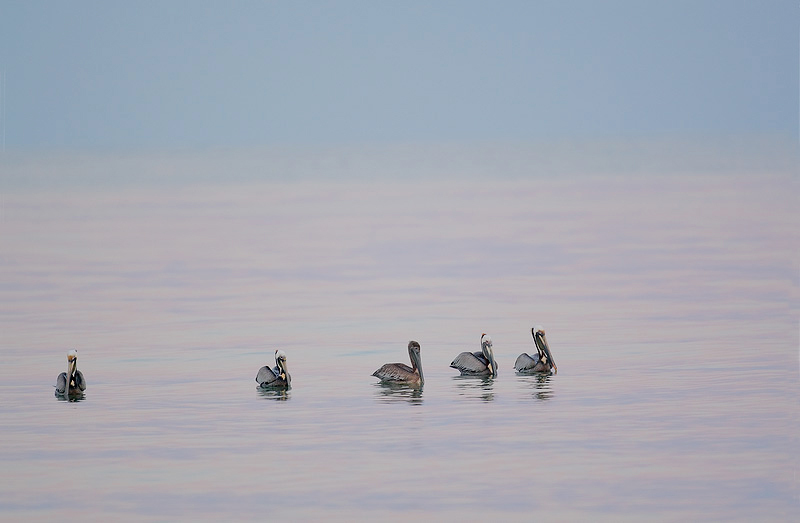 A friend and I were walking towards the Gulf when I noticed that the feeding pelicans were beautifully backlit and that the light and color would be improving with each passing minute. In the process, I discovered a great new spot for low tide afternoons. Drypod Waders are designed to keep your valuable Gitzo Carbon Fiber tripods dry while you are wading, especially in saltwater. If you have always completely disassembled your tripod after each wading session, never had a single leg lock corrode, never had to send a tripod back for a new leg section or two, or never totaled a tripod, then you do not need a set of Drypods. (I once sent three Gitzo tripods to Bogen for repair after two many trips in salt water. I wrote after about 8 months as was told that they had thrown them all into the trash. Really. Drypods are made of a specially formulated plastic sleeves that are approximately 47" long. The foot of each sleeve is reinforced with 4 layers of plain and woven poly for added protection. On the foot of each sleeve is a layer of sacrificial tape applied to allow you to set up on gravel or rough surfaces. All Drypod kits come with three Velcro Wraps to secure the sleeve to the tripod. The standard Weekender Kits come in 3" and 4" widths, with the 3 inch being almost universally popular. The 3" Drypod sleeves have a diameter of approximately 2-3/16" and the 4" approximately 2-11/16.” You should order the smallest size that will fit. All but the larger tripods that have clip locks or wing locks will fit inside the 3” Drypods. There are 4 sleeves in a kit. The extra sleeve is a backup in case a single sleeve develops a leak after repeated abuse. Each kit comes in a heavy Ziploc bag with instructions. Weekenders 3" kits are $26.95 plus $7.00 S&H (Overseas shipping please add $13). Weekenders 4" kits are $28.95 plus $7.00 S&H (Overseas shipping please add $13). The Deluxe units 3" kits are $49.95 plus $11.00 S&H (Overseas shipping please add $17). The Deluxe units 4"kits are $51.00 plus $11.00 S&H (Overseas shipping please add $17). Canon 500mm f/4L IS lens with the 1.4X II TC and the EOS-1D MIII. ISO 320. Evaluative metering +1stop set manually: 1/1600 sec. at f/7.1. Fill flash at zero. I used lots of flash here in the harsh light to even out the exposure and reduce the shadows. Then I used a Reverse S Curves Adjustment (as described in detail in Digital Basics) to further reduce the contrast and the effects of the strong sun. Classroom Session May 30th 6-9PM: Lecture and slide show covering the nuts and bolts of digital nature photography. Meet and greet your instructor, factory reps, and hosts. Hand- on look at products from Tamron and Bogen Imaging. Question and answer session. Refreshments. 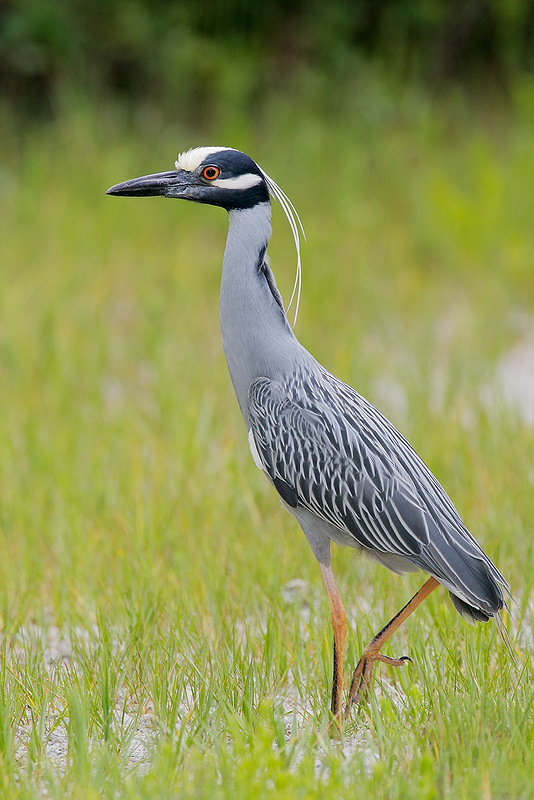 In the Field Session May 31st 9AM-1PM: The In-The-Field session will be held at "The Avian Reconditioning Center." 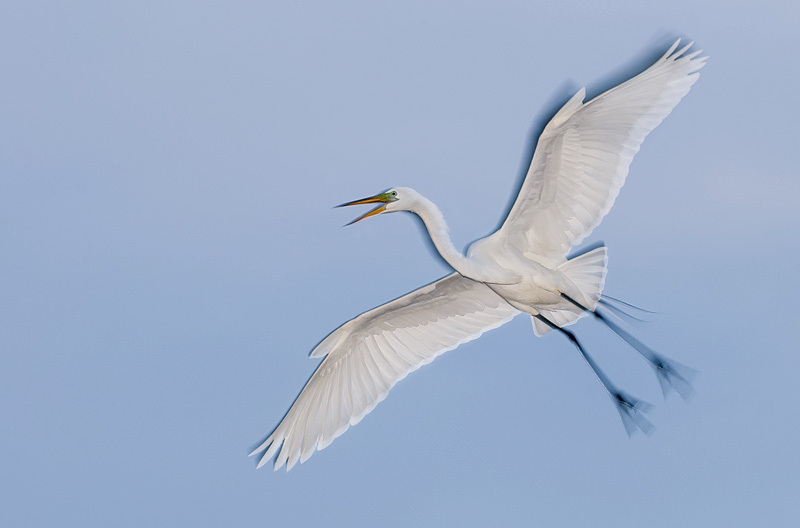 Experience hands-on-instruction covering techniques for creating wildlife portraits and sharp images of birds in flight. Use the latest equipment that Tamron lenses and Bogen Imaging have to offer. Refreshments. Closing Session May 31st 1:45-3PM: Wrap up back at Harmon's photo for a late lunch. Review of the day’s activities, follow-up questions and answers. Door prizes and more. Canon 500mm f/4L IS lens with the EOS 1D MIII. ISO 640. Evaluative metering + 1 2/3 stops: 1/125 sec. at f/4. 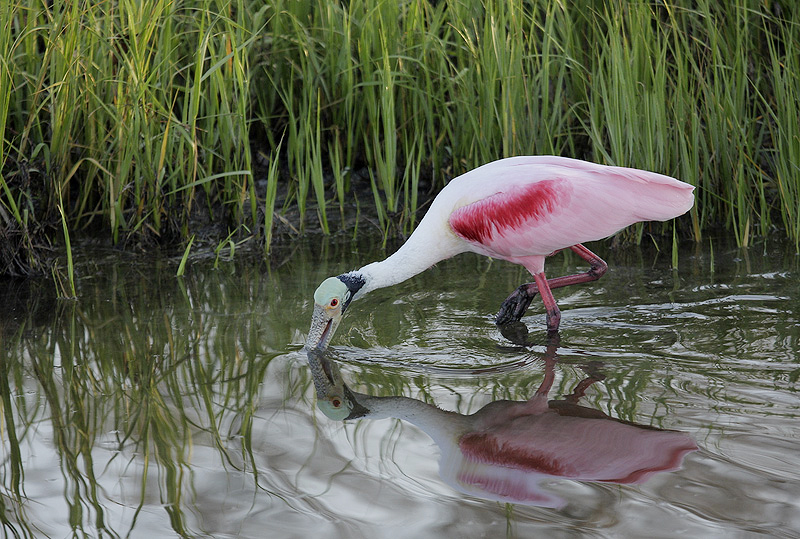 New for the 2008 season, Gatorland is offering a Photographer’s Pass with 7:30 AM entry & late staying until dusk. Gatorland (www.gatorland.com) is located in Kissimmee, FL. The workshop includes 6 full sessions of in-the-field image creation in the AM and PM and three classroom sessions in the afternoons in Gatorland’s new state-of-the-art meeting room. The Gatorland entry fees are not included. A flyer is available for download at www.wildscapeimages.com/extra/2008June-GPIW.pdf and a multiple page in-depth description of the workshop can be found here: www.wildscapeimage.com/extra/2008June-GPIW-FAQ.pdf. 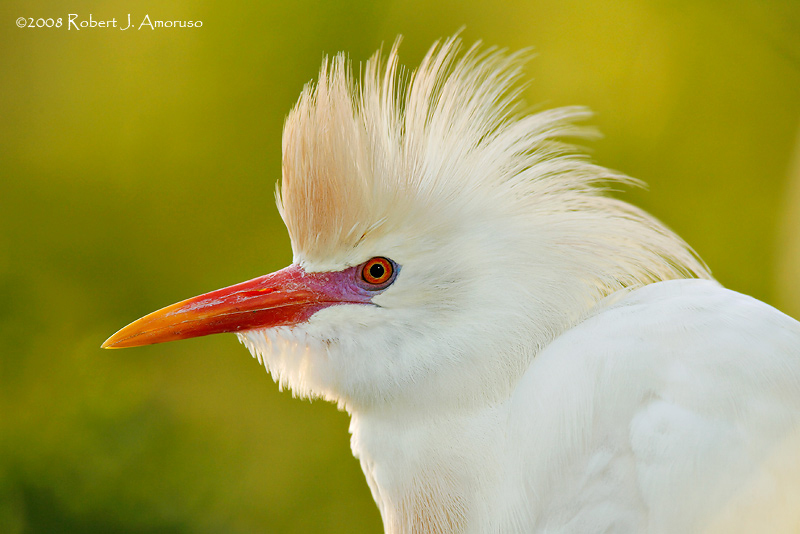 By using a narrow angle of view (telephoto lens) and limited depth-of-field (DOF) Robert Amoruso isolated this Cattle Egret in full breeding plumage. Photographed just before sunset, the egret’s extended crown is backlight and the background is awash in soft rays of the setting sun. 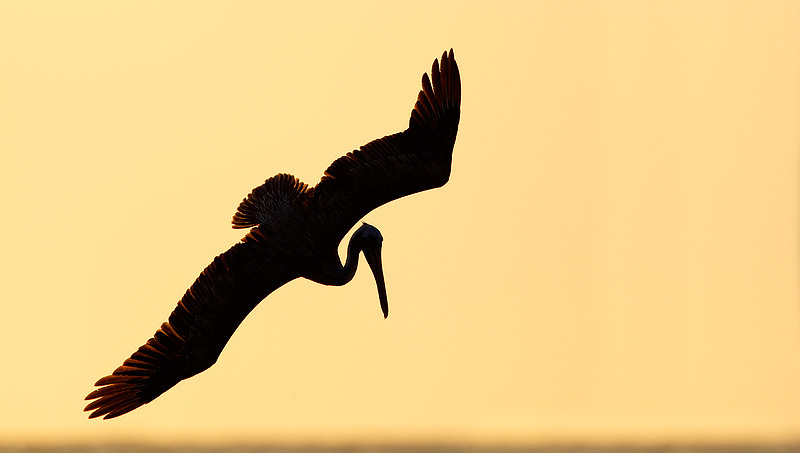 Fill-flash was used to illuminate the shadows in the bird’s face. He waited for the correct head-angle and then created the image. We will help you create images like this on the Gatorland workshop. Nikon D300 and AF-S VR Nikkor 70-200mm 1:2.8G lens. ISO 200. 1/30 sec. at f/7.1 manual mode (Matrix Metering +1/3 stop), zoom at 140mm (210mm 35 equiv). Flash blurs are not for everyone, people sometimes think the blurred edges are due to bad Photoshop processing. In fact the sharp image is created by the flash the blurred edges are ghosting created by the slow 1/30th of second shutter speed. Canon 500mm f/4L IS lens with the 1.4X II TC and the EOS-1D MIII. ISO 800. Evaluative metering +1 stop: 1/250 sec. at f/8. Fill flash at -2 stops. above: Canon 70-200mm f/4L IS lens (handheld at 176 mm) with the EOS-40D. ISO 400. Evaluative metering -1/3 stop: 1/500 sec. at f/4. below: Canon 500mm f/4L IS lens with the 1.4XII TC and the EOS-1D MIII. ISO 400. Evaluative metering +1 stop: 1/250 sec. at f/8. When you find a cooperative subject, be sure to vary your lens choice and your focal lengths, and try to create a variety of images. In the photo above, the grasses and the reflections caught my eye, while in the image below, it was the richly colored scapular feathers.